Goodreads says, "It's 1917, and World War I is at its zenith when Hazel and James first catch sight of each other at a London party. She's a shy and talented pianist; he's a newly minted soldier with dreams of becoming an architect. When they fall in love, it's immediate and deep—and cut short when James is shipped off to the killing fields. Aubrey Edwards is also headed toward the trenches. A gifted musician who's played Carnegie Hall, he's a member of the 15th New York Infantry, an all-African-American regiment being sent to Europe to help end the Great War. Love is the last thing on his mind. But that's before he meets Colette Fournier, a Belgian chanteuse who's already survived unspeakable tragedy at the hands of the Germans. Thirty years after these four lovers' fates collide, the Greek goddess Aphrodite tells their stories to her husband, Hephaestus, and her lover, Ares, in a luxe Manhattan hotel room at the height of World War II. She seeks to answer the age-old question: Why are Love and War eternally drawn to one another? But her quest for a conclusion that will satisfy her jealous husband uncovers a multi-threaded tale of prejudice, trauma, and music and reveals that War is no match for the power of Love." It's 1917, which means WWI is currently happening in full force. We meet Hazel, who is normally a homebody, but goes out one night to play the piano at a party. While there, she meets James, a soldier, whose plans to become an architect are on hold thanks to the Great War. Their attraction is instantaneous, but what will happen when he is shipped off to war and she remains home in her sleepy little town? Then there's Colette, whose entire town in Belgium, suffered due to the German invasion. Her entire family and most of the town was destroyed. Colette enlists to avenge their deaths and because what else is there to do at this point if she wants to make a difference? Lastly, there's Aubrey, an accomplished African-American musician, who is sent to Europe to help fight along side the African American regiment. All of the characters' slowly intertwine as the goddess Aphrodite explains stories to Hephaestus and Ares. 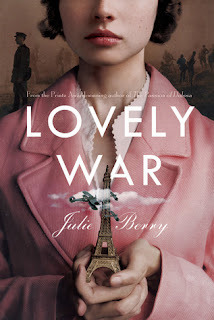 Julie Berry's Lovely War is a moving tale of romance, friendship, tragedy, and essentially, the endurance of love. I really loved the character of Hazel in Lovely War. She has spent most of her life behind a piano and hasn't truly lived. James pushes her out of her comfort zone and they form an instant bond. I loved following along their romance despite the fact that the war complicated things tremendously. I also really appreciated Berry's depictions of the war and what James and other soldiers had to endure. Berry truly brought the horrors of war to light and how its grasp continues to keep a strong hold long after a soldier has left the battlefield. Then there's Colette and Aubrey who were also very interesting characters. Colette's back story truly tugged on my heartstrings and Aubrey was an incredible character as well. Berry depicted not only sexism during World War I, but also racism and how that impacted the American troops serving overseas. Berry's characters practically leaped off the page; I loved them all equally and was completely invested in their stories. I wasn't sure how on earth Berry was going to pull off tying in Greek mythology, especially when it's Aphrodite telling the stories to the other Greek gods. It seemed almost like a plot device, but not only did she make it work, she made it memorable. In fact, I actually started caring about Aphrodite and her drama with Hephaestus, which surprised me! Lovely War was serious at times as it deals with WWI, but it was hopeful. It reminded me of not only the importance of love, but also the staying power of love as well as the power of hope. Needless to say, I adore the overall message in Lovely War and I am completely blown away by Berry's ability to tell a tale. She weaved a magnificent one in and I can't wait to read more of her novels in the future. Lovely War is going down as one of my favorite YA books of the year.